Make your dear one happy by sending this Exclusive Happiness All Around Gift Hamper with your special feelings. Imagine the delight of your loving mother when a Hamper bursting with a variety of items reaches on this occasion of Mother's Day. 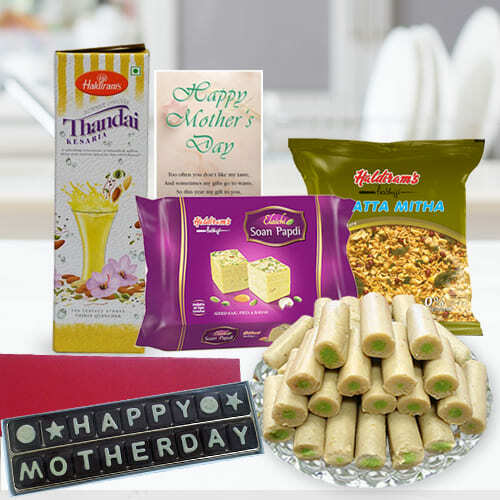 She will be delighted to see the items that include 250gm Haldirams Soan Papdi, Haldirams Kaju Roll 250gm (Gross Weight), 250gm Haldirams Khata Meetha, "Happy Mother’s Day" Chocolates, 750gm Haldiram Thandai Syrup, a Mother’s Day Card and a Best Mother Award Badge.